The operating system is busy with a task which does not require your presence. It should shut down on its own, so that you do not need to come back to switch off the computer. The free utility Vista Shutdown Timer is now available to fulfil this wish and you can download it on to your system from vistashutdowntimer.toflo.de. Click the ‘here’ link at the end of the page after ‘Version 1.8:’ and save the fi le ‘Vista-ShutdownTimer1.8.exe’ in any directory of your system. Installation is not required. Just double click the fi le in Windows Explorer to open it. As per the information provided by the manufacturer of the tool, it works with Windows Vista, XP, 2000, ME and 98. It also performed its task reliably and without problems under Windows 7 during our test. With Vista Shutdown Timer, you can log the user off from your system, set Windows to ‘Hibernate’ or ‘Standby mode’, initiate a ‘Restart’ or ‘Shut Down’ the computer completely at a set time. Just click the relevant button in order to define the desired action. You can initiate the selected action immediately with the ‘Shut down now’ button or set a later time in the extended lower area of the dialog. Here, you can opt from two modes: Either define the desired waiting time in ‘Minutes’ in this unit or set an exact time in the next row. Remove the tick in front of the option ‘Minimize to the system tray’ so that you can access the tool for the current timer via its icon in the taskbar at all times. Then click ‘Start Timer’. Clear notes about the pending action are displayed on the screen just before the time elapses and they are repeated at frequent intervals so that the shutdown does not come as a surprise to you. The tool counts down the last fi fteen seconds. 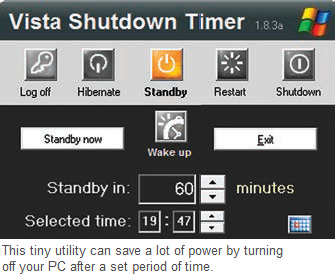 Vista Shutdown Timer provides an option for cancelling the countdown with a click on a single button till approximately five seconds before the selected action.